This 38-week Pre-Professional Development Program is for students ages 17 and up with a passion for circus arts and ready to develop their full potential and pursue a career in circus arts. 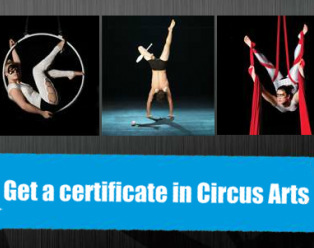 Circus arts requires rigorous physical training and involve not only solid physical preparation, but technical and artistic training in circus, dance and performing arts. The programs involve not only solid physical preparation, but technical and artistic training in circus, dance and performing arts. Student performances/exam are presented before a panel of judges three times during the year and at the completion of the program to evaluate the student's skills and ability to combine technical and artistic skills. The ideal candidate wishes to pursue the training necessary to become a circus artist. In order to achieve this goal, students must commit to an intensive preparatory training, which could be followed by the Professional Artist Program. The candidate demonstrates basic knowledge in the circus arts, dance, a martial art or acrobatic sport with an artistic component, such as artistic or rhythmic gymnastics, trampoline, diving, figure skating, etc. The candidate is in excellent health and demonstrates determination, creativity, discipline and maturity. This 38-week program totals 450+ hours of training per school-year. You can register for this program from September to June. Students registered are required to commit to the full length of the program. Space is limited to 8. Students should wear suitable close-fitting gym clothes. Ballet slippers or jazz shoes are recommended but not essential. Jeans, shoes, hats and jewelry are not permitted. The students will be evaluated 3 times during the year (20% each) plus the final examination presentation (40%). A $250 deposit is due at the last step of the registration process, once accepted in the program. Learning the arts of circus is more than being able to "do the moves", it requires physical and psychological understanding of the techniques. This is the reason why we require, in addition to the training, a minimum of 30 hours of volunteer work. At the completion of the program, with a final score of 60% or higher, the student is awarded the Professional Program certificate. The students with a score below 60% will receive the school certificate. For additional information, please contact Anais Guimond, program coordinator.